Coral bean, Erythrina herbacea, is in the Leguminous family. Another popular name for this deciduous, multi-trunked, shrub is Cherokee bean. In south Florida, or protected areas that do not freeze, it can attain a tree like stature of 24 feet in height. 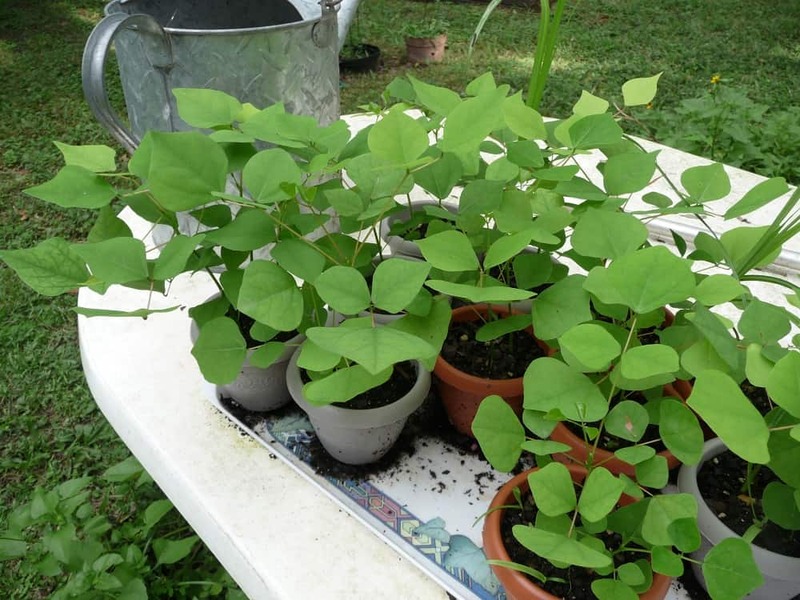 The leaves are deciduous, alternate and compound with three arrow-head shaped leaflets that are 1 to 3 inches in length. The stems have thorns that point downward. 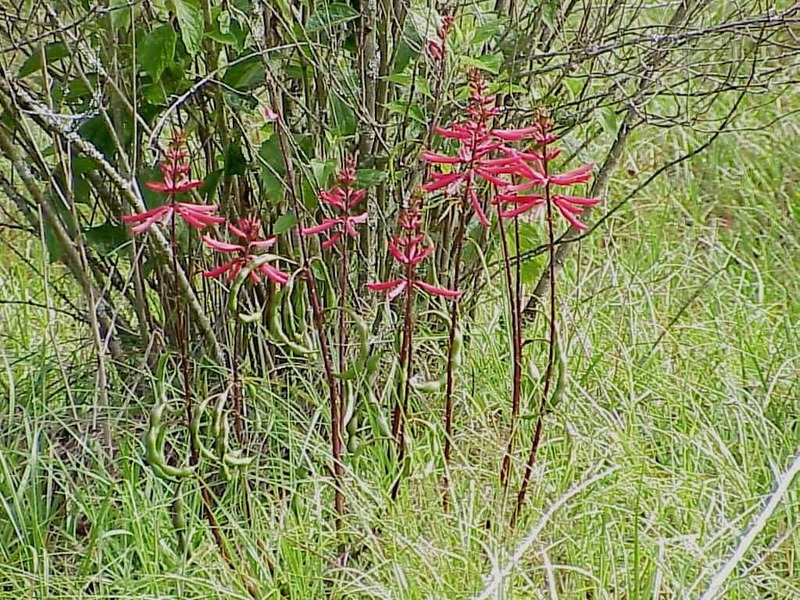 The 2 inch, red tubular, flowers appear in the spring before the leaves appear. The blooms are produced from the prior year’s growth, therefore it is important to not prune away last year’s growth in the spring. It may look like a bunch of twigs, but your patience will be rewarded in the spring with bursts of red flowers. The spring bloom coincides with the ruby-throated hummingbird’s migration. It appears that these plants have adapted their blooming cycles to their pollinator’s migration cycle. The literature states that they bloom in the spring and fall, but I haven’t seen fall blooming in our area. Once the flowers are pollinated a green seed pod develops. The beans inside are white at first and turn bright red upon maturity. Once the pod ripens it will break open along its seam to expose the bright red mature beans. The red beans are poisonous. Removal of the pods is the best way to safeguard against children collecting them. 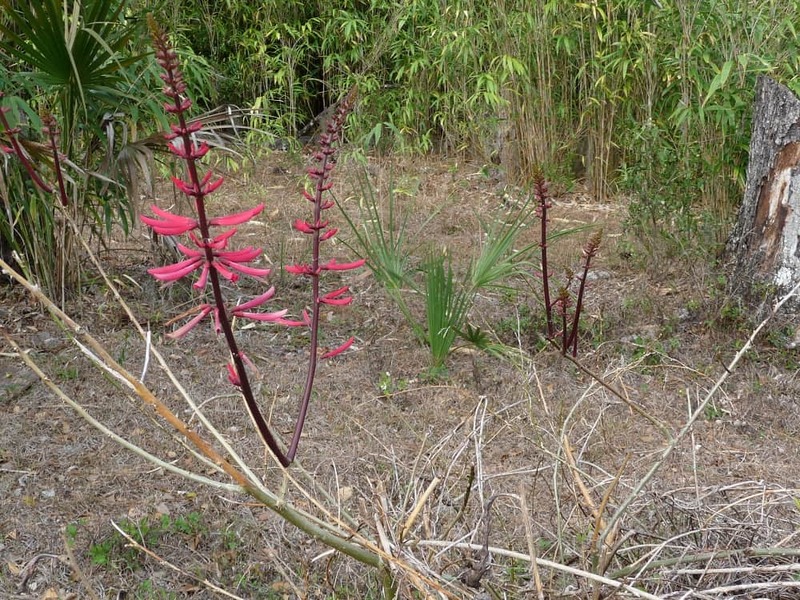 Coral bean is generally found growing in coastal hammocks, inland hammocks and along road sides, but can also be found in open sandy woods and clearings. In the home landscape it can be grown in part shade to full sun with average moisture. They tolerate transplanting well. Some literature lists an Erythrina arborea as a separate species found in south Florida; however most authors believe this to be merely a climatic adaptation. As was stated earlier it will become tree-like if not taken by a freeze. Erythrina is derived from ‘erythros’, which in Greek means red, and herbacea which means not woody. Buy coral bean seeds from Sharon’s Florida Store.